We have a new line paint that is committed to stand up to BC winters…and we’re not done yet! In 2017, we started using this environmentally friendly water-based paint that allows for thicker (and thus longer-lasting) application, on sections of key highways around BC. In addition to delivering durability, the formulation will be combined with newly designed-for-BC glass beads, which improve light reflection to boost the paint’s visibility. The new paint will be specifically applied to sections of some of our busiest roads including Highway 1, 3, 5, 16 and 97. On less-travelled routes that don’t get the wear and tear of winter maintenance, we’ll continue with the paint that we have been using, which performs well on many of our roads. The new glass beads will also be used with that paint, in key areas where reflectivity on wet nights is an issue. The performance of both paints and paint/bead combinations will be monitored in a variety of areas to ensure the best formulation for different locales. At the same time, we’ll keep watching for other paints being developed that can take a pounding and stay bright. Our search for a peak performing paint has been ongoing since summer 2015, when we began testing line paints for improved wear and visibility. There were 18 types of paint, tried in three areas of the province with vastly different weather and traffic conditions – Highway 97 near Prince George, Highway 5 north of Halston Road near Kamloops, and Highway 7 near Maple Ridge. Various application methods were also put on trial. Then we piloted the selected paint on Highway 1, 3, 5 and 5 north, over the winter. Road markings must endure BC’s extreme weather on mountain passes, stay solid under scraping snowplow blades and studded tires, and withstand scouring as vehicle tires roll over winter traction grit. Chains, sometimes required on commercial vehicles, are also brutal on line paint – acting like small milling machines. Our paints are a low volatile organic compound alkyd and a water-based formula. They meet federal regulations that in 2010, discontinued the use of oil-based paint. The selected paint also had to be at a price that makes sense. The ministry occasionally applies other products like inlaid durable thermoplastics, which are installed on the road surface or slightly recessed into the pavement. However, these materials can be up to eight times the cost of paint. Another product used on extreme weather routes (like parts of Highway 16) is a methyl methacrylate resin, which is a two-part, epoxy-like plastic that disperses water quickly and has extra glass beads, but is also extremely expensive. As part of our efforts to find the best paint solution, we shared research information and testing results with our neighbouring highways organizations in Alberta, Alaska, Washington and Idaho. These jurisdictions most closely match our geography and climate which are far harsher than most – if not all – other North American jurisdictions. When you paint more than 30,000 kilometres of markings annually, you want those lines to last! Did you know that we maintain more than 50,000 kilometres of roads and about 4,000 bridges/structures provincially? Check out more of what we do. 1) Has there been any public outreach or market research? 2) What is the decision-making process behind the implementation of this new paint? 3) What is the cost of production? Will taxpayers have to pay more? 4) Do you have plans to improve the road reflector lights as well (the small studs on roads)? We shared your questions with our folks in our maintenance group and they let us know that BC, like most jurisdictions, requires contractors to use only those materials that have been tested or proven effective or area at least the best available. The full list is available on the BC Recognised Products List (RPL). To get a product on that list, the supplier must prove or have evidence from other jurisdictions that their product is safe both physically & environmentally. From there it is up to the contractors who use them to negotiate the price. Over the past four years, we have invited suppliers from all over North America to send us their best paints which we then apply to a “test deck” on a high traffic volume road – which is a real world test of the paints performance. Paints that fail to perform well on these tests are not permitted on the RPL. The cost of production is privileged information held by the supplier and they are not required to share it. Our maintenance contractors must meet specific application performance standards, so, if they use a cheap or ineffective product, they will fail and be penalized. Raised Pavement Markers (RPMs) are provided in a similar way to road marking paints – they must meet a minimum standard. RPMs need to perform in a very harsh environment, withstand the use of carbide steel plough blades. It may interest you to know that we have been asked to share our research with several other countries and North American jurisdictions. The problems we face with winter road maintenance are shared by many!! Thanksgiving Weekend evening October 7th I drove Hwy 1 from Abbortsford to Lions Bay in drizzly wet weather. The visibility of highway marking was exceptionally good in the Fraser Valley where the new high quality paint has been applied to the surface of the asphalt. Upon reaching the North Shore and on through to West Vancouver where Hwy 1 ends and Hwy 99 begins, centerline visibility became progressively worse. Possibly a different maintenance contractor is involved on the Sea-to-Sky or inferior procedures and/or products are used. In May 2018, the BC Ministry of Highways and Infrastructure Online stated its maintenance contractor for the Sea-to-Sky, Miller Capilano Maintenance Corporation would be using larger glass beads in the white lane paint on Hwy 99, to increase reflectivity by 20 per cent and Miller would be applying a second pass of paint to add thickness and improve visibility and durability. I applauded this intention. Instead the maintenance contractor has drastically DECREASED paint visibility at night during a rainstorm by cutting a centimeter deep recess in the asphalt before applying the paint. This was done presumably to improve paint durability on dry days and nights by setting paint lower than the tire treads that cause abrasion. On dark wet nights the paint is now below the surface of a centimeter deep puddle. The earlier problem of negligible retro-reflectivity is now WORSE. The recess fills with water creating puddles; on rainy nights the puddles obscure the paint… the headlights scatter as on any wet surface eliminating the highway centerline. Now there’s barely any recto-reflectivity on dark winter nights when drivers need it the most. Recessing lane paint to minimize tire tread abrasion may work well in desert regions, but it obliterates lane paint where it rains at night like in coastal BC. Recessing lane paint on the Sea-to-Sky is not a solution to the lack of paint retro-reflectivity; it’s created more of a traffic HAZARD than before. An option to correct the lack of visibility problem created by the recess in the asphalt would be to set Stimsonite reflectors or “Cats Eyes” in the recess to protrude millimeters above the tops of the puddles avoiding snow plow blades. I fear many more fatal accidents will occur if this problem’s not fixed. Good morning and thank you for your comment and concern. We shared your comment with our local area manager and Miller Capilano for review. Recessed inlaid paint tends to last longer, especially in areas where there is a lot of snow clearing activities. To date this year, Miller Capilano has painted a total of 379 line kilometres on the Sea to Sky Highway, with an additional 40km of painting taking place in the coming week (weather permitting). The ministry and Miller Capilano will complete an audit on the line painting in the coming weeks to ensure that all new paint meets the MOTI Concession Agreement Specifications. If you could kindly identify the exact areas where the lines are not visible due to pooling water we will review with Miller Capilano to see if anything is out of spec. Thanks and we look forward to hearing back from you soon. The exact area where lines are not visible during heavy winter rains on Highway 99 occurs from where the inlaid recessed paint begins near Eagle Ridge Exit 2 towards Lions Bay in the north and beyond. It occurs when a puddle forms in the inlaid recess. The inlaid paint might be more visible through the puddle for drivers of trucks similar to those used by Miller Capilano because the sight angle when driving a truck is steeper whereas for low compact cars the sight angle is more flat. I don’t drive a truck, so I wouldn’t know. The portion of Hwy 99 from Exit 2 to Lions Bay is not an area where there is a lot of snow. The only time I have seen a snow plow on this stretch of the Sea-to-Sky was in 2010 during the Winter Olympics when Miller Capilano parked one near Ansell Place as a precaution. It didn’t move because it wasn’t needed. Please inform whether you have carefully considered my reply sent two months ago on Jan / 12th / 2019. We have sent your message forward and will have Miller Capilano review the location you identified. We will let you know when we hear back. Thanks for following up. Who is the manufacturer of the paint? And can it be purchased commercially for other businesses? We have an application that would improve the safety of our industry. Glad that I found this information available and I hope something is done to improve our region. I live in Vernon and the main Hwys through town and on the outlying areas including Hwy 97 and Hwy 6 are terrible visability even in broad daylight. Seems to me we are suppose to guess where the center lines are cause we don’t have very many of them. Road painting seems to get done in bits and drabs and sometimes the roads are not even cleaned from all the gravel and then they paint them. Want to talk about a waste of money …who paints when roads aren’t cleaned? Contributing to the terrible visability, many of the areas have no street lighting or reflective road markers. The road markers or even old style match sticks they use to use years ago would really help. Why are we not implimenting the old tryed and true methods anymore? At least the roads were more visable. No one drives on them wearing the paint away. Seems to me if the paint wears off the road and the road is oil…then oil based paint is the only thing that will adhere properly. Seriously the government need to think seriously at how rediculous this is to be using enviromentally freindly paint on a road made of oil. Seriously it’s not going to make any difference to the environment. *Peoples safety should be number #1 and we should not be playing games testing paint in lu of peoples safety. I have traveled through the United States and cannot beleive how fantastic the road markings are. From the integrated lights recessed in the roads, reflective match sticks on corners, or metal bumper rails, and hazard signs (warning for a low shoulder, bumps on road etc.) I am not even going to start talking about how hazards are ignored here but we have to expect to dodge all the holes and the drivers at the same time cause they dont know where the center line is. Maybe we should be looking at how the United States takes care of their roads. As with so many positive developments in road safety technology is our ally. This is great news. As a driver road markings are my friend; however, as a cyclist they can present as a serious hazard. Are there measurements for how glass beads affect traction? This is a greater issue in urban settings but anecdotally at least I can say sewer grates, manhole covers, train tracks and paint are factors in many bicycle and perhaps motorcycle collisions. Great question – we have sent it forward for review and will let you know what we hear back. Unfortunately, any road surface can get slick under the right conditions. With our line marking materials, we rely on the presence of the glass bead to provide a rough surface on both paint and durable materials . Any thermoplastic (durable) line markings are required to meet a minimum specific surface friction based on the British Pendulum test. The intent is to provide a road surface that has as close as is possible an even friction level relative to the lines and asphalt. Hope that this helps! Please inform whether you have received my request sent on Feb / 09th / 2018. Sorry – yes, we have received your comment and are working to get an answer. We hope to have a response for you very soon. Can you please inform specs for both types of paint (high build paint and premium glass bead)? What durability the testings conducted have reached? Is the transport ministry going to maintain annual painting and the main benefit is to have lines visible throughout the year? News conveyed last year in Vancouver Sun say the cost for paint will be 30% higher (http://vancouversun.com/news/politics/province-picks-new-high-durability-paint-for-highway-lines). Previous cost while using lower polluting alkyd paint was $367/Km (annual budget of 11 million for 30,000 km), what’s the cost per Km for each type (high build and premium glass bead)? Our apologies for the delay in responding. We take our commitment to providing a safe and efficient transportation network very seriously, and clear road markings for drivers are an important part of this commitment. As you are likely aware, changes in environmental regulations have meant a move away from more resilient acrylic paints we used in the past, to waterborne latex paints that are less harmful to the environment. These paints are less durable than previous paints and we are working with paint manufacturers on solutions to the issue. We have minimum retro-reflectance standards for all types of pavement markings and these standards are similar for all transportation jurisdictions around the world (retro-reflectivity is the term used to describe the night visibility of pavement markings and is crucial to highway safety.) We also use a state of the art mobile retro-reflectometer to delve more deeply into the performance of our new line marking paint in places where durability and visibility have been a problem. Different sections of the province have different issues to deal with in regards to line marking visibility and durability (road markings must endure BC’s extreme weather on mountain passes, stay solid under scraping snowplow blades and studded tires, and withstand scouring as vehicle tires roll over winter traction grit.) Therefore, no single paint or application will work for everything and the cost per kilometre is difficult to determine as this cost can vary greatly depending on where the paint is being applied. Our line painting contractors repaint over 30,000 kilometres of centre and lane lines every year across the province, at a cost of over $11 million annually. Each year $2 m worth of durable long line is placed throughout the province – primarily in the South Coast Region. Durable markings typically cost 10 -15 times the cost of standard paint per metre to install, include MMA (Methyl Methacrylate), Thermoplastics, polyuria, epoxies & special pre-made materials like tape and range in price form $5-$10 per lineal metre. We are happy to say that the recent announcement of the 2018 budget includes operating expenditure increases of $46.5 million for our ministry. Of those additional funds, $12 million has been allocated for road and bridge maintenance and electrical maintenance, as well as specific provisions for enhancing pavement marking. As part of our efforts to find the best paint solution, we also share research information and testing results with our neighboring highways organizations in Alberta, Alaska, Washington and Idaho. These jurisdictions most closely match our geography and climate which are far harsher than most – if not all – other North American jurisdictions. can you please tell us what this product is called, whats its longevity compared to tradition paints, and does the ministry ever consider the cost benefit analysis of maybe applying such products in the rainiest and most poorly lit provincial highways? Can you please share what the average cost per km is for marking a 2 lane highway using the new formula? You mentioned the increased costs of Thermoplastics etc, but when they last 5x longer, and they can provide much more retro reflectivity, therefore increasing night time safety, the cost benefit analysis makes it worth the investment? there was also a comment about Switzerland, but you didnt address that comment, only to refer some other jurisdictions that we work with, but that list of other jurisdictions seems very small, relative to the size of our globe. Europe is usually a decade ahead of us, so maybe they are the people to look to. HWY 14 got the new paint this past fall, and although the retro reflectivity was much better than old formula, it was only better in the dry conditions. The first day of rain, those new formula lines were just as invisible as the old ones. Now we have announcement from our premier that we will have wider lines as part of a safety upgrade, but if the formula is the same, wider invisible formula will still be invisible. Maybe a trial section of thermoplastics on Hwy 14 and see what feedback you get from the public? Just wanted to let you know that we have received your question and we are working on getting you more information. It is difficult to get exact costs (which varies per km across the province), which is why the estimate of durable being 5-8 times the cost of paint. Thank you for getting back to me on this. I look forward to hearing back and learning more. We take our commitment to providing a safe and efficient transportation network very seriously, and clear road markings for drivers are an important part of this commitment. As you are likely aware, changes in environmental regulations have meant a move away from more resilient acrylic paints we used in the past, to waterborne latex paints that are less harmful to the environment. These paints are less durable than previous paints and we are working with paint manufacturers on solutions to the issue. We are happy to say that the recent announcement of the 2018 budget includes operating expenditure increases of $46.5 million for our ministry. Of those additional funds, $12 million has been allocated for road and bridge maintenance and electrical maintenance, as well as specific provisions for enhancing pavement marking. As part of our efforts to find the best paint solution, we also share research information and testing results with our neighboring highways organizations in Alberta, Alaska, Washington and Idaho. These jurisdictions most closely match our geography and climate which are far harsher than most – if not all – other North American jurisdictions. Highway 1 in the Duncan area needs more visible lines. Driving from Chemainus south at night particularily when it is raining, is difficult when the lines are not very or even visible. Reflective paint is needed now, not some time in the future. Thank you for your comment. We sent your concern forward directly to the local area manager who informed us that line painting for Duncan, north Duncan and Duncan to Chemainus is scheduled for this spring. During these darker and rainier winter months, we encourage everyone to slow down, drive to conditions and ensure their vehicle is in good working condition. I live in the Cowichan Valley which has a lot of seniors and many very dark unlit areas. I am only 65 and I find that the lines on the roads are very hard to see at night. More needs to be done to improve the road markings in our area. I also find that the construction on the Malahat with the many orange pylons can sometimes be confusing on dark rainy nights. Thank you for connecting with us here and sharing your concerns. We have sent your comment regarding visibility on Cowichan Valley and Malahat roads to the local area manager and the Malahat Safety Improvement project manager for review. We have shared your comments about the Cowichan Valley with the local area manager and will share back any information we hear back with you. The project manager for the Malahat Safety Project did inform us that we will be looking at installing enhancemed wet night visibility line markings in the future along the corridor following the completion of the current phase of safety improvements, as we will then have a very large continuous segment of the corridor with relatively new asphalt to install the lines on. Enhanced pavement markings are substantially more costly than standard road marking paint, and as such, we do not want to install them just to have them torn up by a reconstruction project the next year. Highway 1 through Duncan gets a lot of traffic and it would be great to have the lines more visible at hight. Also on the cross roads of Tzouhalem/ Trunk. Thanks for your consideration. Hi Mary and thank you for your suggestion. We are focussing our efforts with the newer paint on dark and wet stretches of road, just like the ones on the South Island and the Lower Mainland. So glad to hear there is something being done to make the lines more visible at night and in rainy weather. It can’t happen soon enough! I’m sure it will prevent many avoidable accidents. Thanks for your comment Katy! I recall on a trip to Switzerland that highway marking lines were very visible in wet (rain, melting snow) conditions, in a climate very similar to B.C.’s. So, has anyone reached out to any European jurisdictions for their experiences with winter-resistant products ? The budgets for line maintenance in those countries are no doubt as stretched as ours, and their residents are just as concerned about highway safety (givern their higher speed limits !) and road surface quality. Thank you for your comment, we have shared it with our program area manager who informed us that we have been working with our partner jurisdictions of Alaska, Alberta, Washington State & Idaho to resolve the issues around painted line durability. Each of these Transportation agencies share materials research and we also share and use each other’s paint formulations. We have worked with other Canadian transportation agencies in Ontario, Saskatchewan & Quebec who follow the same Canadian materials regulations. During an extremely heavy downpour in the Spring, in daylight, the fog line on the Trans Canada Highway that I traveled in North Cowichan, between Beverly St. and Drinkwater Rd. was totally obliterated from view. This is dangerous! Also, nightime driving is made more dangerous because a lot of these lines are invisible. People in their forties are complaining about the lack of visibility on the Malahat in the dark. Surely to goodness safety is of the utmost concern and I would request that you use this reflective paint on the roads and highway on Vancouver Island. Thank you. Thanks for sharing your concern here with us. We are focussing our efforts with the newer paint on dark and wet stretches of road, just like the ones on the South Island and the Lower Mainland. Finally…maybe we will be able to see the lines on those dark, rainy nights. Since the abolishment of lead based paint, it’s been a real struggle to see the lines in the glare of oncoming traffic. Thanks for your comment. We are also excited to find a solution too. With labour being one of the highest costs in most industries, does it not make more sense to use more expensive paint that last longer in all areas and reduce labour costs? 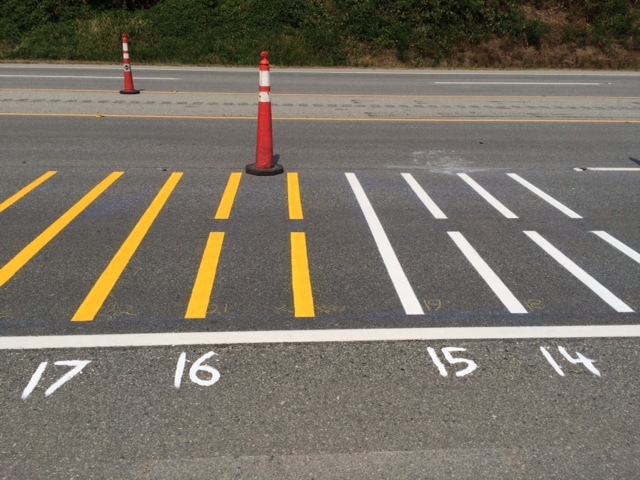 PS: Highway 19 needs some major crosswalk painting done. We’ve sent your comment forward to the folks in charge of our line painting program for some feedback on your suggestion. Is there somewhere on Highway 19 specifically you are concerned about? We will send forward for follow up. I would like more information on the application process please. The application process uses basically the same technology and equipment as before. Our contractors will need to be extra diligent with monitoring air temperature and humidity during application as the heavier application rates will need +10C and rising temperatures with low humidity for optimal effectiveness. In some areas we may need additional traffic control to avoid line smearing by traffic. The new bead is one specially designed for BC and the the heavier application of paint. It has additional beads that are larger in order to give good initial retro reflectivity with the thicker paints. Hope that this helps! So it only took 5 years to get round to testing improved paint when that has been the number one item raised by the public with the Minister. At least he managed to get round to implementing the roll out (just) before the election.